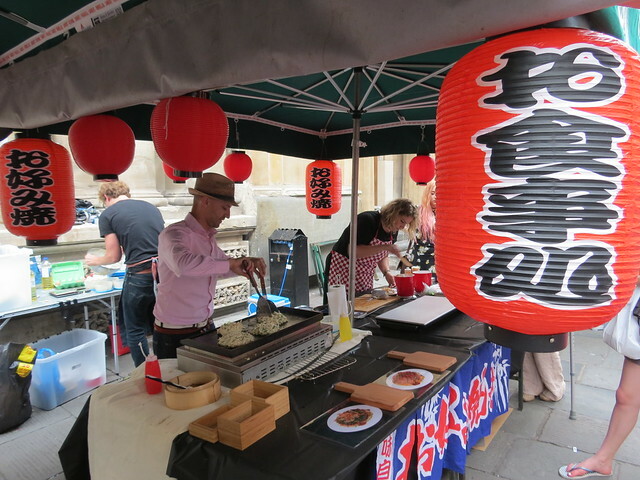 Okonomiyaki is one of my all-time favourite Japanese streetfood dishes, so you can imagine how delighted I was to find out about Kansai Kitchen, a new Japanese street food stall in Bristol specialising in okonomiyaki! 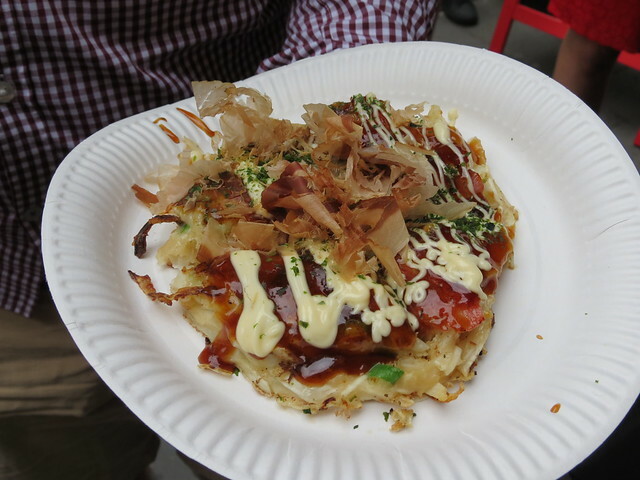 For those of you who don’t know, okonomiyaki (お好み焼き) is a kind of savoury pancake from the Kansai region of Japan. The name comes from ‘okonomi’ meaning ‘what you like’ and ‘yaki’ meaning ‘grilled’. 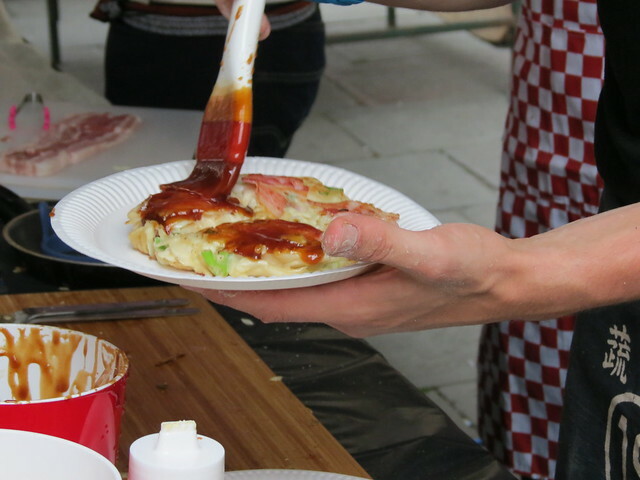 Typical toppings include meat, seafood and vegetables, but the wonderful thing about okonomiyaki is that it’s all about what you like – anything goes! 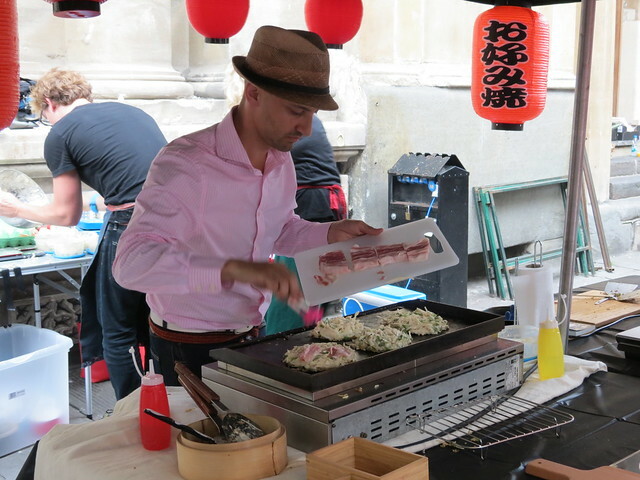 Kansai Kitchen had two types of okonomiyaki on offer on Friday night – with bacon or without. I think it was a good idea to keep things simple, and the ‘without bacon’ version was just fantastic! Friday night was the first St Nick’s Night Market of the summer, and it was Kansai Kitchen’s debut. Kansai Kitchen’s creators Liam and Tim are friends of the company I work for, so we all went out after work to support them and fill our bellies with yummy okonomiyaki. Even without the support of friends, I think they would have done just fine! 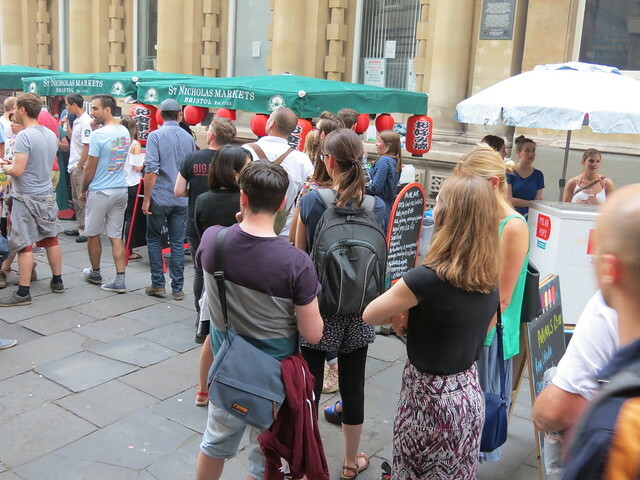 Queues at Kansai Kitchen were the longest of all the stalls, and everyone seemed interested. It smelt good, and I think people were intrigued. 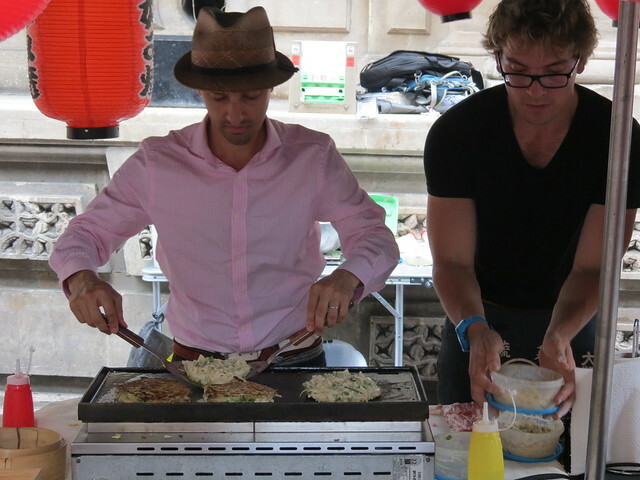 Bristol has Japanese restaurants, but Japanese street food is still something that’s hard to get here. Other stalls were selling pretty standard fare, but this was something different, and I think the crowds liked it! Kansai Kitchen’s next gig will be at Bristol pride on 11th July, at Brewdog. If you’ve never tried okonomiyaki I highly recommend you go and find them! We obviously share a love for okonomiyaki! Have you ever been to Abeno in London? Another good place to go if you need a fix! I can’t wait to try it when I am in Bristol next month!